In this webcast, Library Journal experts explore the radical re-thinking toward a large-scale APC-based business model that could work well for many scientific disciplines. Attendees will get a clearer understanding of exactly what has been recommended, the evidence in support, and the arguments against. and you will receive an email from Library Journal with the URL to access for free the archive for this event! Need help getting registered? Send an email describing your problem. 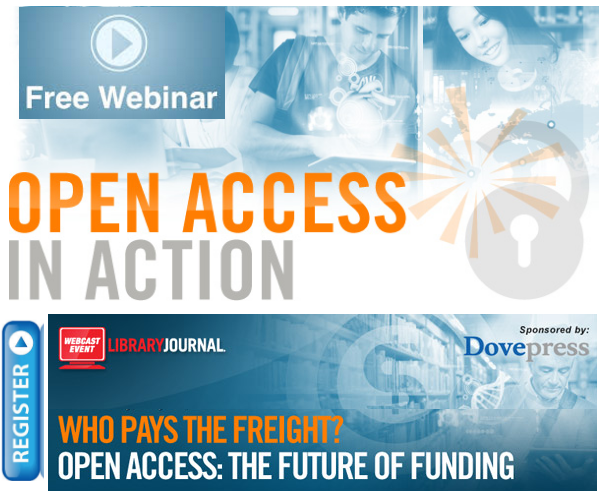 This webcast is part of Open Access in Action series, sponsored by Dove Press, which tracks the evolution of important OA issues through a library lens by presenting regular original articles, video interviews, news, and perspectives. To learn more about how librarians like you are driving practice across the lifestyle of open access, be sure to visit this Open Access in Action hub page. The attention on funding models has been increasing for years, as has discussion around journal transition and conversion. Best practices presume these models are continually refined through historical experience, policy and competition. But the iterative nature of Open Access (OA) can come with a cost in terms of implementation, integration, and aggregation performance. One of the proposed means for rapidly implementing OA would transfer traditional journal subscription payments to Author Payment Charges (APCs). But, as always, questions remain. In December 2015, The Berlin 12 meeting brought together representatives from several regions (Asia, Europe, and North America) to discuss a proposal to flip subscription-based journals to OA models. That meeting and the subsequent discourse has gotten the attention of policy makers, researchers, publishers, librarians, and many others. The proposal's ambitious sweep has rapidly sharpened today's OA discourse, with voices that support this type of business model fully, conditionally, or not at all. So, who pays the freight? Opportunities from OpenAIRE to fund your APC-free Open Access Journal!